The Queensland Farmers’ Federation (QFF) and industry members are celebrating Queensland’s integral role in Australia’s agricultural story as part of National Agriculture Day, today, 21 November 2018. National Agriculture Day is a chance for all Australians to reflect on the pivotal role agriculture has played in the country’s history, by celebrating its successes and resolving to work towards its bright future. QFF President Stuart Armitage said Queenslanders had a lot to celebrate on National Agriculture Day, with the state’s farmers producing the highest quality food, fibre and foliage. “Queensland farmers account for about 24 per cent of Australia’s overall production value, making it the number one agricultural state in the country,” Mr Armitage said. Mr Armitage said National Agriculture Day provided an opportunity to not only celebrate, but also educate the public about the critical role farmers play in feeding, clothing and providing amenity for all Queenslanders, other Australians and people in other countries. “While our farmers and rural communities are tough, they have faced several challenges this year with damaging storms, a protracted drought and food tampering issues,” Mr Armitage said. 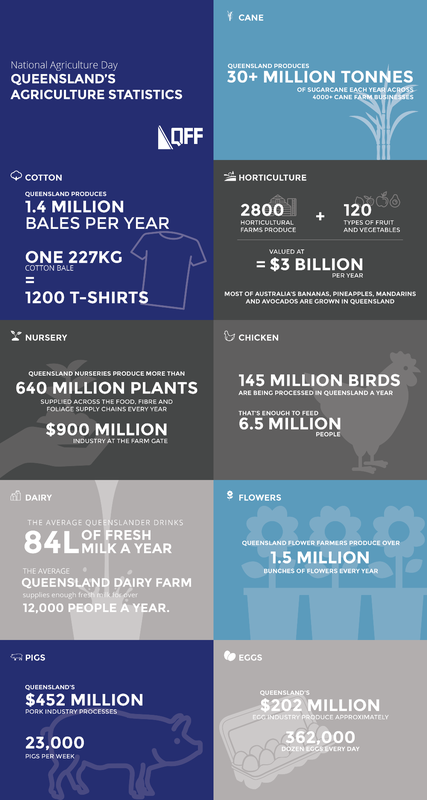 For a national breakdown of Australian agriculture’s worth and value visit: www.agday.org.au.